On 22 July 1700 Vanbrugh was granted leave to build a house in the ruins of the home of the Vice-Chamberlain, Vanbrugh's friend Peregrine Bertie. It had been destroyed by the fire at Whitehall in 1698. Castle Howard was in the process of being built, but Vanbrugh's own house at Whitehall was his first visible work in architecture. There was much criticism at the time in pamphlets and occasional broadsheets. Jonathan Swift first referred to Vanbrugh's House as `Goose-Py' in a poem of 1703, 'Vanbrug's House'. Poets, says Swift, come looking for the house and cannot find it until `at length they in the Rubbish spy / A Thing resembling a Goose Py'. Vanbrugh's small bachelor house originally stood on a site of demolition and redevelopment unlike any other house. Street houses were normally part of a terrace and only very grand houses in the town centre would have freestanding side elevations. This house was a departure from the expectations of the time. The front elevation has as its origins the end of the north wings of Castle Howard. It was demolished in 1898. 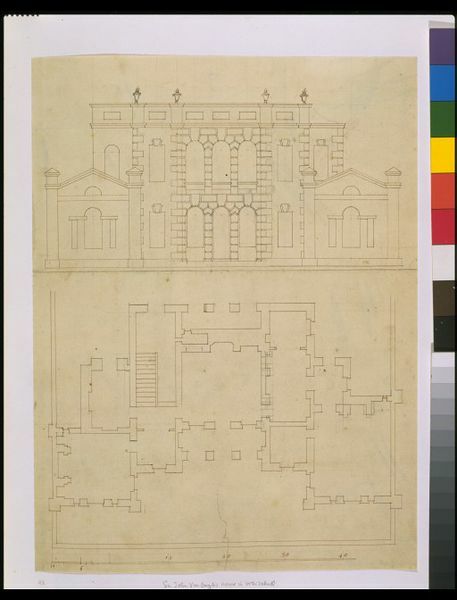 Plan and elevation of Goose-Pie House, Sir John Vanbrugh's house in Whitehall, built in 1701. The central three bays of the seven bay front are rusticated and the two outer bays project on the ground floor only. Scale: 1 inch to 7 feet. Inscribed in ink with scale. On 22 July 1700 Vanbrugh was granted leave to build a house in the ruins of the home of the Vice-Chamberlain, Vanbrugh's friend Peregrine Bertie. It had been destroyed by the fire at Whitehall in 1698. 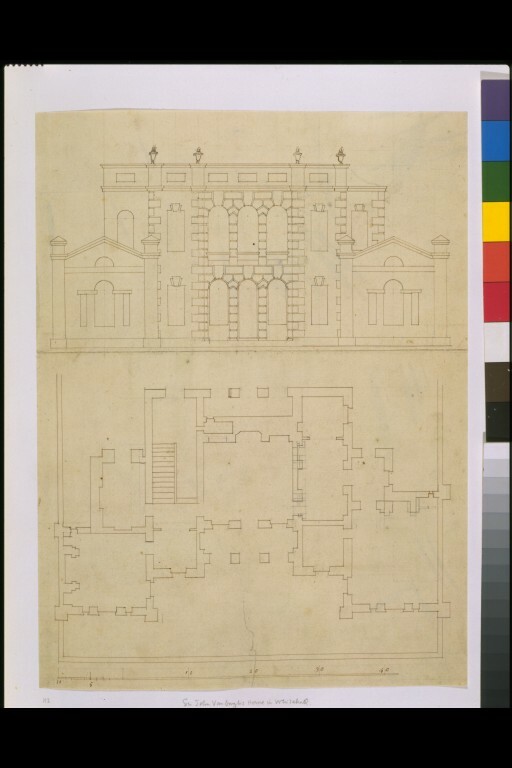 Castle Howard was in the process of being built, but Vanbrugh's own house at Whitehall was his first visible work in architecture. There was much criticism at the time in pamphlets and occasional broadsheets. Jonathan Swift first referred to Vanbrugh's House as `Goose-Py' in a poem of 1703, 'Vanbrug's House'. Poets, says Swift, come looking for the house and cannot find it until `at length they in the Rubbish spy / A Thing resembling a Goose Py'. Vanbrugh's small bachelor house originally stood on a site of demolition and redevelopment unlike any other house. Street houses were normally part of a terrace and only very grand houses in the town centre would have freestanding side elevations. This house was a departure from the expectations of the time. The front elevation has as its origins the end of the north wings of Castle Howard. It was demolished in 1898. See Downes (1987). 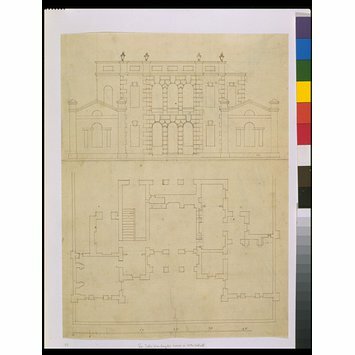 Plan and elevation of 'Goose-Pie House', Whitehall; the Vanbrugh Album; circle of Sir John Vanbrugh; ca. 1700. Lorimer, C. and Newton, C. (ed. ), The collection of drawings by Sir John Vanbrugh and his circle in the Victoria and Albert Museum, London: V & A, 1996, p. 52, cat. 133. Downes, K., Sir John Vanbrugh: A Biography, 1987, pp. 223-233.